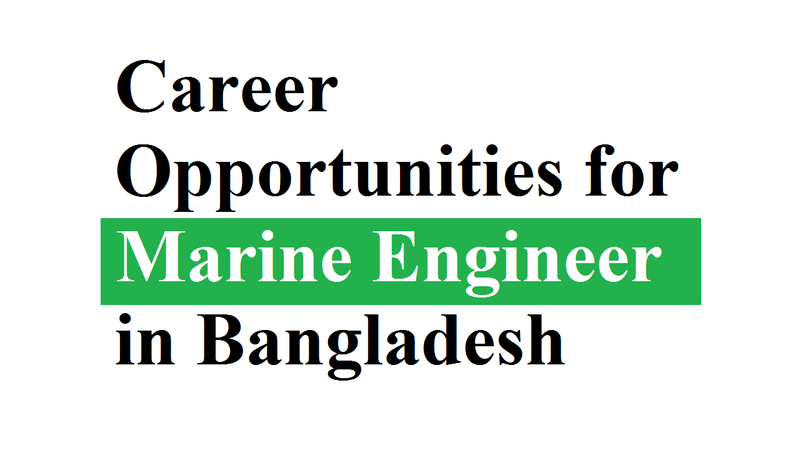 Career opportunities for Marine Engineer in Bangladesh. You would be wondered while thinking who has made ships and submarines, and who tests them out to make sure they are safe for the public, and who repairs them when things go wrong. These will be your jobs when you’ll be a marine engineer in Bangladesh. The job is like the proverb of ‘seeing the festival and selling some bananas’ where you can travel to far-off places and get paid for it. Those who are marine engineers are in charge of everything, including mechanical, electrical, or structural on a ship. Also, as it may range from computers to the crankshaft, air conditioning to refrigerators, doors to windshield wipers, it’s the marine engineer who will fix it. Apart from these, the ‘marine industries’ manufacture and provide support services in the Leisure, Naval, Commercial, Offshore Renewable Energy etc. As a marine engineer in Bangladesh can get very well paid for designing new ships, cruise ships are really popular these days that are basically floating cities of fun. But, you must not only provide innovative market leading products but ensure that it continues to develop the skills and technology needed for the long-term to remain truly competitive. You could specialize in project management, research, and development or consultancy once you’ve gained some management experience. So, the government and the private sectors offer fantastic entry points and training as well as the option of sponsorship to attend specialist maritime training colleges for anyone considering a career as a marine engineer. But, the great thing is that there are opportunities overseas for experienced marine engineers. As a result, why don’t you choose to become a marine engineer in Bangladesh? Although there are several ways to become a marine engineer in Bangladesh, generally, you’ll need a degree, a foundation degree, an HNC or an HND in marine engineering. If you want to a marine engineer then there a few educational institutes in Bangladesh. But, it’s better if you get a degree for marine engineering from abroad. For example, if you choose the UK then you can get admission into the Falmouth, Plymouth, Newcastle, Southampton Solent, and South Tyneside College. While having attended a full-time college course, such as the Level 3 Diploma in Shipping and Maritime Occupations (engineering pathway) or by doing a marine engineer apprenticeship, progression onto these higher education qualifications is possible by having suitable A-levels. On the other hand, you’ll earn BDT24, 00, 000 to BDT28, 00, 000 annually as a graduate landscape architect, which varies depending on the skills and experiences. Your wage can increase to BDT 30, 00,000- BDT 40, 00,000 when you gain experience and it may be rise to BDT 55, 00,000 when you become extremely experienced. When you’re a marine engineer in Bangladesh, you’ll be involved designing, building, servicing and repairing boats, ships, underwater crafts, and offshore platforms and equipment. So, if you’re a certified marine engineer then you can work for private companies, the Ministry of Defense, and foreign jobs. Because you could be working on building the ship, or working onboard the ship itself, your job will have so much variety. Apart from these, you have to design, build and take care of the marine systems on ships as a marine engineer. And you’d be expected to regularly survey ships, assessing whether they are safe to use as a marine engineer. This is because you must be an expert and well qualified marine engineer. Now, let’s know the steps to become a marine engineer in Bangladesh. When working towards gaining an Engineering Officer of the Watch Certificate of Competence, Engineering Officers are required to undertake training involving spending time at both college and at sea. In order to cover personal survival techniques, fire prevention, and firefighting, basic first aid and personal safety and social responsibilities and hold an ENG1 seafarer’s medical certificate, you also need to complete STCW basic safety training courses. In addition to these, you will need training and certificates in Medical First Aid, Advanced Fire Fighting and CPSC & RB (Proficiency in Survival Craft and Rescue Boats) as a marine engineer. As a marine engineer, you will be a crucial part of a team when at sea or working offshore. Besides, you should make sure the ship can operate efficiently and as required by the Captain and Government while working with the Weapon Engineering, Logistics and Warfare departments. But, you could join an integrated project team, reviewing and improving the current fleet or designing the fleet of the future as an onshore marine engineer. You get on an apprenticeship or degree course to become a marine engineer, aim to get the school qualifications that would help. Including math and a science subject with grades 9-4 (A*-C), this is usually at least five GCSE or the equivalent. HNC or HND course you’ll also most likely need at 1-3 A-levels or the equivalent in a relevant subject for a degree. But, if you’re thinking of technical college as an alternative to school then you can choose to study for a relevant BTEC national certificate or diploma instead. And if you want to scout around for early career opportunities like apprenticeships or stay in the world of education and do further learning after school you can decide. You can train as an engineering technician with employers if you want to get into marine engineering straight after school. As they offer degree apprenticeships, you can study for a degree while on the job and you don’t have to pay student fees either. With various employers, you could also apply for a marine engineering technician apprenticeship. But, they have numerous pathways to becoming a marine engineer if you go directly into the Merchant Navy. As they offer undergraduate programs as well as graduate schemes, everyone applying must undergo a medical examination which is paid for by an employer/potential employer or a training provider. If you go down these routes then it will give you first-hand experience of marine engineering and will help you plot your course.